Colombian cuisine is one of the unknown cuisines to the world that needs some recognition because by all means some of their foods are pretty amazing and tasty. While Colombians mainly deep fry everything under the sun, there are other times when traditional Colombian recipes call for big pots and stews. Now, I want to share with you something that I have loved since my time living here in Colombia. And yes, this traditional Colombian food that I am about to share with you is a fried item, although in my view a healthy fried item. Nevertheless, this dish tastes amazing and I wish that it could be a household staple for Mexican food as well (actually I will be sharing with you a fusion of a Mexican Patacon in the future). Patacones are flattened plantains that are deep fried crispy and then smothered with meat (beef, chicken or pork), cheese and a sauce called Hogao(slow cooked onions, red peppers and tomatoes). Although before I begin sharing with you this Colombian dish, I first need to say that there’re different regions in Colombia that have variations of the dish. The people of Antioquia serve Patacones just as I stated, with meats, dried cheese and Hogao sauce. While in Bogota, they make patacones more elegant in some places by applying different ingredients and salsas. What I am going to share with you is the style from the Calenos or the people from the Valle de Cauca region, which to me are some of the best Patacones in Colombia. In Cali, Colombia the patacon is smothered with meat and potatoes and they are more wet then dried. To be honest, their patacones are more like a stew on top of the fried plantain, and that is why I love their style. Also, the fried plantain is thicker and less crunchy than they are from other regions of the country. Furthermore, the style I will share with you is directly from a resident of Cali and the Pacific. First, you need to find a green plantain and cut it into 1/4ths, that way you have a nice big and round platter. Then you would need to blanch the plantain in hot oil until it softens up enough to where you can form it into a circle. Here I am showing you a tool they use to flatten the hot plantain, but you can easily flatten it with a plate from your cupboard in the kitchen. After you flatten the plantain, then re-fry it for another 2 min until the plantain is crispy on the outside and soft in the inside. That is the key, do not deep fry it until it is too crunchy but just enough to not break apart when you pick it up with your hands while eating. Take out the fried plantain from the hot oil and into a napkin and sprinkle some salt while oiled. Now for the sauce, this is easy and all you need is cooked chicken and potatoes. Boil a whole chicken with carrots and potatoes for about an hour. When the chicken is cooked enough to peel the meat off the bone, put the meat into another pot with the potatoes and carrots. Add 3 cloves of garlic, 1 cup of diced white onion and cook until translucent in other pan. When onions are translucent, add some of the chicken stock and a chicken bullion (depending on the amount of salt you used in your broth too). Add the chicken, potatoes and carrots from the other pot and simmer all the ingredients for about 20 min until all the flavors infuse. At that point you can add some pepper and salt to taste and that is it. 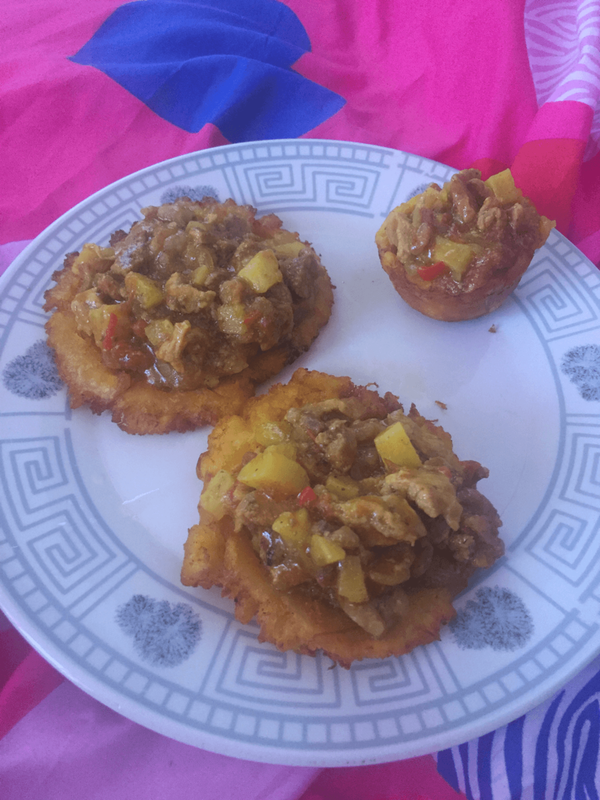 Just smother the fried plantain with the chicken stew and you have a Colombian Patacon. You could eat it with a fork or depending on how wet you have your stew, you can eat it with your hands. This is traditional Colombian food, and I hope that you are inspired to make it at home.